The use of the word 'tropical' in the title of this set seems an odd choice as you don't associate the Ottoman Empire with the tropics. What Strelets mean is perhaps 'Arabian', although in truth there is no particularly good word to describe this form of uniform except to say that it was characteristic of the southern part of the Empire. 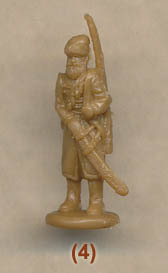 The essential feature of this set is that all the troops wear the kafiya, which is widely thought of as an Arab form of dress. Arabs constituted the largest proportion of the Ottoman Army in 1914 after the Anatolian Turks themselves, and roughly half of the empire at that time would be described as Arab. Naturally you would imagine such troops mostly fought in such areas as Palestine, Syria and Mesopotamia, but in fact Arab units were to be found on all the Ottoman fronts, including Gallipoli and the Caucasus. However the rise in Turkish nationalism at the time caused many Arabs to become disenchanted with the empire, and while many remained loyal throughout the war, many others were increasingly viewed with suspicion by the high command and kept as reserves when possible. The first thing to say about the kafiya is that it was not an absolute indicator that the wearer was an Arab. So having discussed the Arabs in the Ottoman Army, we now have to say that these are probably Arabs, but not necessarily. Other than the kafiya these men wear perfectly ordinary Ottoman uniform for the last war of that old and decaying empire. They have the single-breasted tunic, trousers, puttees and short boots that were typical of all modern armies in 1914. The style of all these items is correct here, including the reinforcement patches on the knees, although the tunics tended to vary anyway in terms of pockets and so on. The officer has very unwisely chosen to make himself stand out from his men, and so wears a fez and long boots, highly unlikely on any actual battlefield but technically acceptable. The men have some variety of kit, but the majority have a bandolier round the waist, which was non-regulation but common nonetheless. Some have two sets of pouches at the front in the German style, and all but the machine gunner have a bayonet scabbard on the left hip and a water bottle on the right, which is correct. Just one man also has a haversack on the right hip, but variations like this are easy to accept so no problem there. For most that is the full extent of their kit, but two of the figures (third man in rows one and two) also have a full pack on their backs (and an entrenching tool on one). Given the heat that often characterised the environment where these men fought it would seem that fighting with a full pack would be avoided whenever possible, but perhaps that was sometimes unavoidable. All the men have vertical straps that support the waist belt and meet at the back to form a 'Y' pattern. This gave us some doubts, partly because most pictures show such men with no such straps when in action. When on the march and carrying their pack then yes, such straps do appear, so the suspicion is this follows the German model of the time whereby they form part of the pack, and cannot be worn without it. However a few pictures do exist of straps where there is no pack, so while we harbour some doubts as to the authenticity of these we will say no more. Again, the officer has been foolish in going into battle with his sword, something that did not happen for obvious reasons, and was probably a lesson learned during the wars fought immediately before World War One, so was not even a feature of the early part of the War. The men carry a rifle which could be one of several but is probably a Mauser, the most common weapon, while the officer and machine gunner carry a pistol instead. The machine gun is the Maxim, again the most common of the models used, and has been quite nicely done, although it is missing its condenser, a vital element, particularly in the heat of Palestine or Arabia. Over the years the standard of Strelets sculpting has probably ranged wider than any other manufacturer, from some truly awful efforts (remember the first Dacians?) to some highly creditable recent efforts. However much of the range settled on a chunky and slightly basic pattern with exaggerated smaller details and a lack of elegance. This set does a bit better than that, for although it certainly has some chunky details like the bayonet scabbards and pistol, overall the proportions are better and the figures look quite good. Detail on the rifles is a bit hit and miss, but the machine gun is nicely done. The man firing from prone has no face worthy of the name, as used to be normal since the mould cannot reach this area, but the other faces are reasonable. The last figure in our top row has some excess plastic between rifle and body, but generally there is virtually no flash at all, so these are nice and clean. The choice of poses is fairly conventional, which is no sort of criticism as these are the sorts of poses that most customers will find useful. The second pose in the top row presents some difficulties however, as the man is holding his rifle directly in front of his chest. Holding it this way means he has less control over it than by his side, and why is he holding it this way anyway? The pose suggests he is defending himself against a mounted opponent, which is feasible, but not a pose we would have chosen as that would be a rare event. The machine gunner is less than ideal because he is not looking directly down the barrel of his weapon, which would allow him to aim it. Instead his head is well above it, so while sitting behind it is fine, he should be stooping to make sure his shots hit their target. The man feeding the ammunition belt has the problem that the belt ends a fair bit below the belt intake on the gun, so ideally he needs to be raised somewhat so belt meets weapon properly. One more point about the machine gun is it has been position on a mound, which virtually fills the gap between the tripod legs. While this is surely a device to avoid the problems of moulding a tripod, the legs are not aligned anyway, which is odd. Those wondering about the item below the gun barrel will want to know that it is the handle of an entrenching tool stuck in the ground, a quirky little feature. Although we were concerned about the belts on the men’s backs, the set only lost an accuracy point for the officer, who should not be wearing a sword in battle, and nor is he likely to be wearing the fez by this date either. The men however are accurate, and generally nicely sculpted with little excess to remove. Our comments on the poses are fairly trivial, and this is quite a nice animated set which feels like it suits its subject well. These men fill a big gap in the available sets of Ottoman infantry, and because of their involvement in so many campaigns they are a real step forward in the coverage of the Great War in the Middle East.